Tonight the Bulls tip-off for the second time in a week against their longtime Central Division rivals, the Indiana Pacers, in the second of four meetings on the season. The Bulls won the first get-together played at the United Center, 118-101, thanks to shooting .523 from the field, .429 from three and .905 (19-of-21) from the free throw line. Chicago ran off to a 64-41 lead at halftime and never looked back. Doug McDermott came off the Bulls’ bench and led all scorers with 23 points, while Jimmy Butler added 16 points on 6-of-9 shooting and Rajon Rondo handed out 13 assists. Indiana hits the hardwood tonight desperately looking to bounce back after getting thrashed, 125-107, by the Milwaukee Bucks Thursday night in Brewtown. The Bucks played bigger, taller, and, most notably, stronger and faster, as they bullied their way into the paint, scoring 62 points from close range. They also blew past the Pacers in transition, posting 34 fastbreak points, and they also stepped-up behind the arc, knocking down 12 from long distance. This season’s Pacers has a decidedly different look and feel from the past. Nate McMillan has been handed the reins of the team and is emphasizing speed and a faster-paced game. Indy generally likes to run out a smaller lineup designed to put a lot of points on the board in short period of time. They look to place a great deal of stress on opponents by getting out on the break at every turn. Chicago’s task this evening is to do whatever is necessary to slow them down. The Bulls game plan has always been to out-hustle and out-work opponents in every conceivable way. As a team, the Bulls have done a terrific job of pounding the boards this season, and thus if they continue to do that sort of thing tonight, they’ll have a better than even chance to come out on top. As mentioned earlier, Indiana wants to run and turn every game into a track meet. But if the Bulls can control the boards, and do so convincingly, the Pacers running game would essentially have very little gas to go on. Defensively, the Bulls need to make the Pacers work and earn every point and every rebound they get. One of the main reasons Chicago has gotten off to a good start has been the team’s scrappiness at both ends of the floor. To be successful, the Bulls have to be unselfish, unyielding, hardnosed and blue collar in all phases of the game. Offensively, Chicago needs to keep the ball moving from player-to-player, side-to-side. The Bulls can’t afford to walk it up the floor and play a one-on-one game. The ball needs to be shared freely while everyone cuts in and out of the paint and all around the arc. 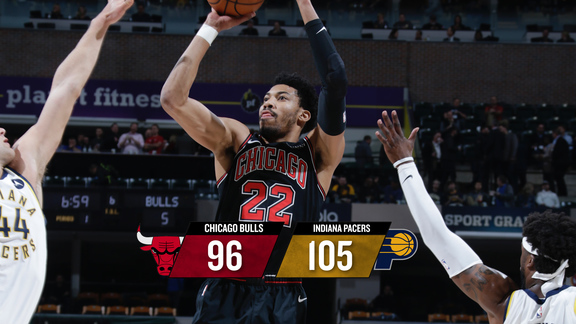 Simply put, the Bulls need to force Indiana to expend a lot of extra energy at the defensive end in order to leave town on a winning note.